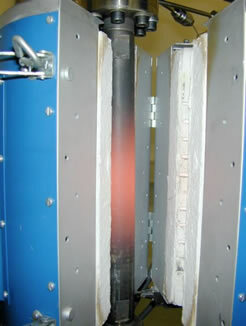 Phreatic Explosion experiments with water saturated samples, P&T sensors installed in the range of 20°C – 400°C and 0.1 – 25 MPa. 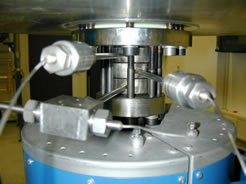 The shock-tube devices are tailor-made and can be operated with a variety of set-ups to investigate aspects of fragmentation behaviour or natural and analogue material as: fragmentation threshold, fragmentation speed and permeability via a pulse-decay method. The shock-tubes operate from room temperature up to 900°C and at pressures between 1 bar (atmospheric) to 50 MPa applied pressure using by default argon gas for pressurization (pressurization by nitrogen or H2O vapour is also possible). 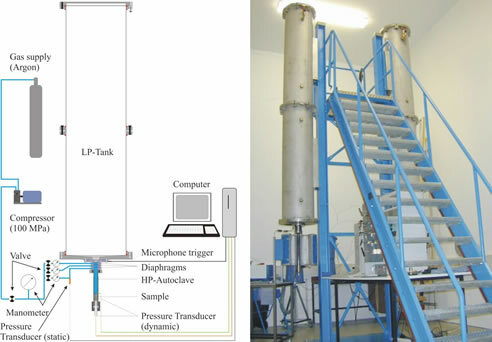 Depending on the set-up, the experiment is monitored by a varying number of pressure and temperature sensors. The experimental pyroclasts are fully recoverable and thus allow determining the fragmentation efficiency. 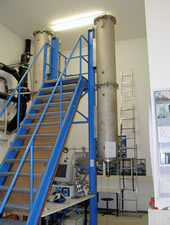 A Micrometric, fully automated helium pycnometer is installed in the FragLab. 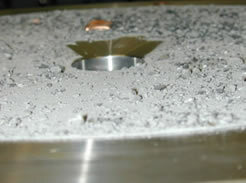 Maximum sample size is limited to 61mm in height and 40 mm in diameter. 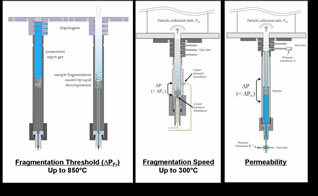 The pycnometer measures the volume (not accessible to helium gas) displaced by the sample, together with the sample mass, its density can be achieved. The connected porosity can be calculated knowing the geometric volume of the sample. Total and isolated porosity is determined by crushing the sample and measuring its powder density. 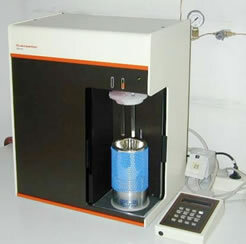 The Laser Diffraction Particle Size Analyzer installed at FrabLab operates solely with wet samples (sample in water suspension). 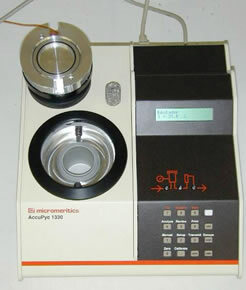 It measures particle size using the classic Mie theory of light scattering and Beckman Coulter exclusive PIDS technology (Polarization Intensity Differential Scattering), offering high resolution and reproducibility. These analyzers provide size distribution in volume, number and surface area in one measurement, with an overall sizing range from 40 nm to 2000 µm. 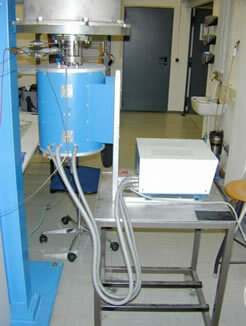 An additional module allows to expose the sample to ultrasonic pulses, i.e. testing for agglomeration.